Howdy! I'm new to the BC world, and therefore, this sight as well. I bought "Hank" 4 months ago, at 8 weeks old. He was the last of his litter and I got a deal. I'd just started managing a very quiet herd, and the black mouths didn't have the control for these girls. Just wasn't a good fit, so I shopped border collies. From the time I got him home I knew I had a good one. It took him about three days to come out of his shell, but he's been the easiest, most challenging dog I've ever trained. 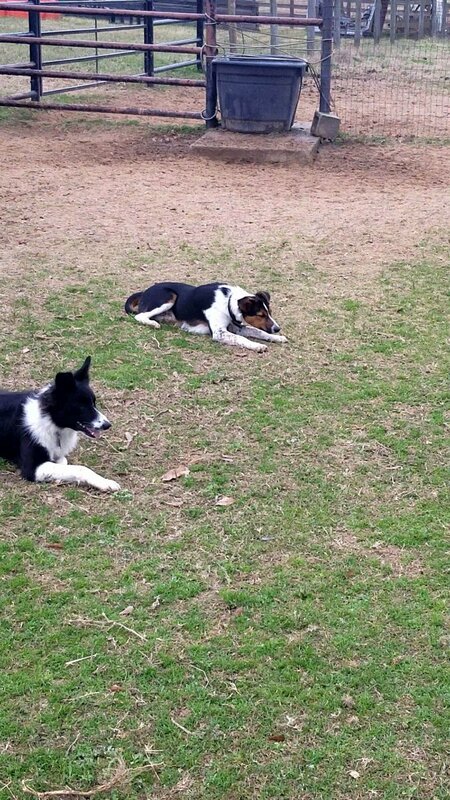 So, earlier this month, my boss went to Wickenburg to rope for two months, and took his two collies with him. We've been short handed and I took on the task of moving yearlings on and off the rye grass for three hours a day. Me and my stick got 'em off okay for about the first three days, but as the grass got stronger, it became too much for one man. Well, Hank was standing at his normal post, just outside the pasture fence, watching with sharp eyes. When the yearlings broke on me for about the third time, Hank let out the first bark I'd heard him make. He was one week shy of six months. He was staring at me real hard, and in a moment of weakness I said, what the hell, and said "Ok. Walk up.". I've never been more amazed in all my 40 years. I have a video from that day, and it's the only way to know. Amazing. All Natural. Unadulterated. Shear. TALENT and STYLE. In the last three weeks, he's moved cattle everyday. By himself, no other dogs, and his control is phenomenal. In the last few days, after he got rolled by a heifer, he has gotten very mouthy. I know I let him on stock too early, but that ship sailed. What now? Do I put him on a line or just keep downing him every 5 seconds? He's the smartest, most driven dog, I've ever seen. I don't want to screw him up. Advice? Congratulations on your good fortune with Hank! He sounds like a real good'un! Do you have access to some calves or gentler cows that you could section off and train on him a little bit in a smaller area? From the sound of his smarts, it might only take 5 or 10 minutes a day to get a bit of a handle on him. Having a youngster work calves or cows up and down a fence, sending them to the head to stop and helping them let the stock escape a bit before sending them back around can build confidence that the dog is in control and also can show them that they don't need to bite to get things moving. Pups often will get mouthy on cattle or sheep at that age as they 'test their tools' but you don't want unnecessary gripping to become a habit as it can be self-rewarding. You're right that you don't want to down him too much at this stage either, because you don't want to take away his power. What you're looking for is a bit of self-control and if he's got a good, solid mind you might just get that at this age. 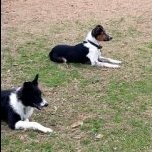 I do know that many cattledog folk start their pups a bit earlier than many sheepdogger might, so if Hank comes from early-starting lines he just might be ready for the Big Jobs. Keep us posted, and thanks for the videos! Good luck!